I don’t know about you, but I always like to have a crunchy snack on hand… something a little savoury, a little salty and a little sweet. These candied espresso pecans fit the bill! Relatively low in fat and sugar, these caffeine packed nuts will help you power through the afternoon slump. If you don’t have instant espresso powder, you can substitute by using 50% more dark roast instant coffee. Just note that it will have a slightly harsher more acidic taste than the espresso powder, but it might just be okay considering the sugar and cinnamon in the recipe. This recipe will make about 4 cups of candied nuts. Preheat oven to 325°F. Spray large rimmed baking sheet with nonstick spray. Whisk the sugar, ground espresso beans, espresso powder, cinnamon and salt together in small bowl. Whisk egg white in large bowl until frothy. Add pecans and toss to coat. Sprinkle the pecans with espresso mixture and toss to coat. Spread coated pecans on prepared sheet in single layer. Bake 5 minutes. Slide spatula under the nuts to loosen them from baking sheet and stir, rearranging in single layer. Bake until the pecans are dry to touch, about 5 minutes longer. Loosen pecans from the sheet again, and then rest to cool on the sheet. 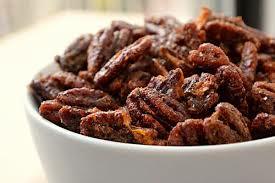 These candied pecans can be made 2 weeks ahead and stored in airtight container at room temperature.